St Columba's Church stand close to the north coast of South Walls, half a mile east of the pier at Longhope and in a site giving excellent views along the shore to the village. 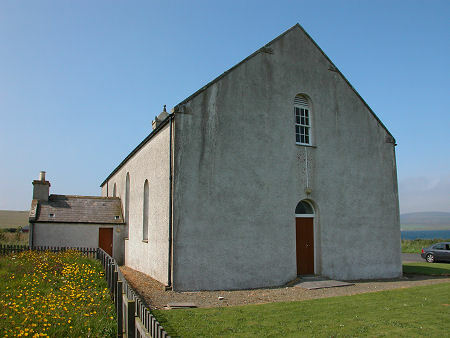 Following a reorganisation of parishes to take account of Hoy's falling population during much of the second half of the 1900s, St Columba's Church now serves much of South Walls and Hoy itself. 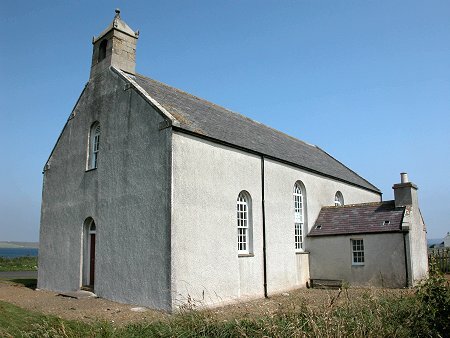 In the process St John's Church, visible on the other side of the inlet of Longhope in North Walls was made redundant. 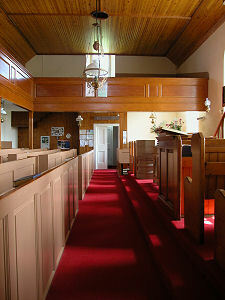 St John's is now preserved by a trust which brought it in 2001. 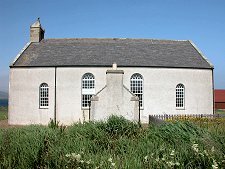 Externally, St Columba's is a large grey-harled rectangular box, built in 1832 with a vestry on its south side and a porch on the north side. A small bellcote has been added to the top of the west gable. St Columba's has no graveyard, instead simply standing on the roadside with a surrounding mown area and dense borders distinguishing its grounds from the nearby field. 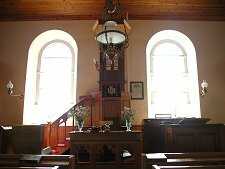 Internally you find a layout more usually associated with T-plan churches, with an imposing pulpit placed centrally on the south wall and galleries placed around the north, east and west walls. 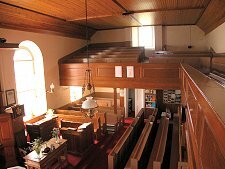 This layout can often appear unfriendly, even intimidating: but in St Columba's the sense of space produces a much more attractive church. In large measure this is probably down to the relatively light and attractive colour of the woodwork, which carries through from the stalls on the ground floor to the galleries; and even to the lining of the ceiling.